MANILA — The Department of Health (DOH) on Thursday urged the public to have their children vaccinated against measles following its declaration of a measles outbreak in the National Capital Region (NCR), Luzon, and Eastern Visayas. In a press briefing, Health Secretary Francisco Duque III said measles is a highly contagious disease that can be prevented by vaccination. “It can be transferred from one person to another through coughing, sneezing and close personal contact, and its symptoms include cough, runny nose, red eyes or conjunctivitis, fever skin and rashes which last for more than three days,” he said in a press briefing. Citing that immunization and vitamin A supplementation remain as the best defenses against measles, Duque urged mothers to bring their children to the health centers for appropriate vaccination and treatment at the first sign of fever. “Ang mga bakuna natin sa health centers ay dekalidad, siguradong epektibo at binibigay na libre galing sa buwis ng mga tao. Huwag po natin ihalo dito ang issue ng Dengvaxia, kasi ilang dekada nang napatunayang epektibo ang mga bakuna, gaya ng marami sa inyo dito sa aking harapan, na nabakunahan dati pa (The vaccines in our health centers are of good quality, have been proven effective and are free, courtesy of the citizen’s taxes. Let’s not involve the Denvaxia issue here. These vaccines have been proven to be effective for decades, just like many of you here before me who have been vaccinated [when you were young]),” he said. Duque said measles can lead to complications, such as diarrhea, middle ear infection, pneumonia, encephalitis, malnutrition, blindness, and even death. “In addition to vaccine, building the nutritional status of the sick person and increasing oral rehydration are important measures to increase body resistance and replace lost body fluids caused by coughing, diarrhea and perspiration,” he said. 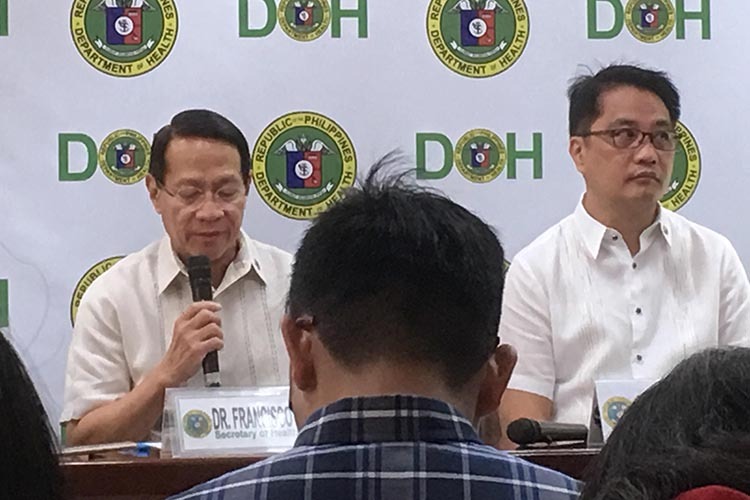 DOH Undersecretary Eric Domingo, meanwhile, said the unvaccinated population has been increasing since 2015 so the department has taken extra effort to educate the public about the importance of vaccines. “We tried the first round in March and April 2018, then the second round on October 2018 and it is not quite successful. There will be a phase three for one year this 2019, really focusing on the immunization of the children. We’ll have supplemental immunizations, outbreak immunizations,” he added. On the other hand, DOH-NCR Director Corazon Flores said their medical teams have gone house-to-house to promote the measles vaccine. “Iyong may mga classified cases as early as December, may outbreak response na po at continuous na po. Na-encounter pa rin namin ang mga magulang na ayaw pabakunahan ang kanilang mga anak kaya nakikiusap kami (Those with classified cases as early as December, there has already been an outbreak response and this continues. We still encounter parents who don’t want their children vaccinated but we plead to them). Of course, we’re informing them about the complications, as you can see it can be easily spread within a household),” she said. Duque said measles vaccines are just one of the many free vaccines the DOH gives to the public through its immunization program. “Mayroon po tayong bakuna para sa diphtheria, tetanus, polio, measles, mumps, rubella, extra pulmonary tuberculosis, meningitis, hepatitis B. Mayroon po tayong vaccine panlaban sa cervical cancer sa mga kababaihan, panlaban sa pneumonia para sa mga kabataan at para din sa mga matatanda. Ito po ang mga bakuna na bumubuo sa (We have vaccines for diphtheria, tetanus, polio, measles, mumps, rubella, extra pulmonary tuberculosis, meningitis, hepatitis B. We have vaccine against cervical cancer for women, against pneumonia for children and for adults. These are the vaccines that constitute the) fully-immunized children,” he added. The DOH Epidemiology Bureau (EB) reported an increasing trend in measles cases in the Ilocos, Cagayan Valley, Central Luzon, Calabarzon (Cavite, Laguna, Batangas, Rizal, Quezon), Mimaropa (Mindoro, Marinduque, Romblon, Palawan) and Bicol regions as of January 26. According to DOH EB’s validated data, Calabarzon and NCR have the highest case fatality rates for measles, with Calabarzon recording 575 cases with nine deaths, and NCR logging 441 cases with five deaths. They are followed by Central Luzon, which has 192 cases, four deaths; Western Visayas with 104 cases, three deaths; and Central Visayas with 71 cases, one death. Duque said the DOH is closely monitoring Mimaropa with 70 cases, no death; Ilocos with 64 cases, two deaths; Northern Mindanao with 60 cases, no death; Eastern Visayas with 54 cases, one death; and Soccsksargen with 43 cases, no death. He clarified that there is no new strain of the measles virus plaguing the country.